While driving back from Turoa skifield today, L and I listened to the TED Radio Hour on RNZ National. TED stands for Technology Entertainment Design. It is the name given to an American non-profit organisation that arranges for very clever and passionate people to give an 18 minute ‘talk of their life’ to a conference audience, from one of those three subject headings above. Their talks are recorded, and made available for viewing for free on the Net. Extremely interesting and inspiring, check them out on TED.com. The speaker today was Barry Swartz. He was talking about his research into the ‘secret of happiness’. He contended that the surfeit of choice available in modern western-style societies actually contributes to a reduction in peoples happiness levels. His conclusion was that the secret of happiness lay in having Low Expectations. This struck a nerve with me. The wine came with lavish praise from pundits, great provenance, from 18yr old vines, and had an impressive price tag. This is gonna be amazeballs, I thought. I even had a tasting of their 2010s, and loved them (tho the Mates was not my high point of the tasting). I cracked the lid. The wine was light gold. Hmm. Should it have been darker? Light aged-wine bouquet of honey citrus and butterscotch on nose. Pear flavours in the mouth, restrained oak and malo. Very fine, but not particularly remarkable. And it was this lack of remarkableness that disappointed. L liked it, it was clearly a well-made quality wine, but where was the wow factor? The big flavours? I expected to be blown away, like I was by the first Sacred Hill Riflemans I tasted. Is this an example of marketing over substance? I’d have to taste it again to be sure, but at the current price per glass that is unlikely. I will give it a 4, when it should have been a 5, and that makes me grumpily want 2 say 3. One good thing is that I have a KR Coddington Chardonnay from the same vintage still to drink. That vineyard site scored highest with me in the earlier tasting, so I hope it delivers better. This is the second high-price NZ cellar wine that has left me feeling flat in a month. 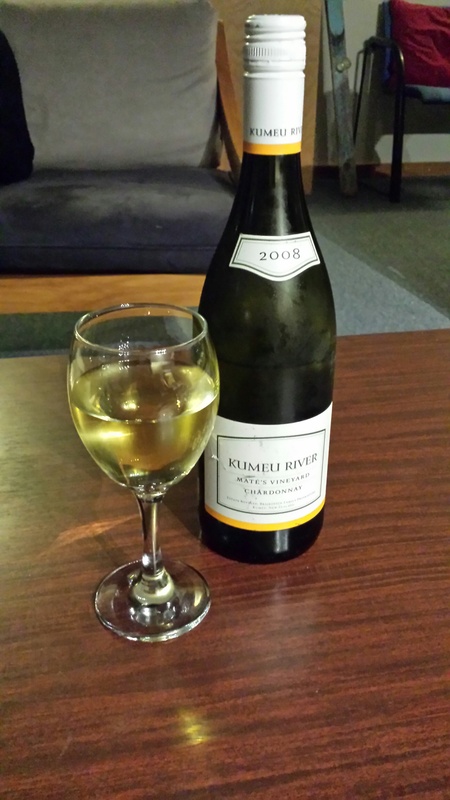 I had a glass of 2011 Palliser Chardonnay earlier in the week which was sensational, and that was half the price of the latest KR Mates Vineyard offering. This entry was tagged 2008, 2011, 4, Chardonnay, Kumeu River, Mastes Vineyard, Mates Vineyard, Palliser Estate. Bookmark the permalink. I am loving your blogs and missing NZ wines as we travel though Europe. G and I shared an interesting wine at dinner last night at a great restaurant called Sage.